I’m really pleased to introduce you to the lovely Carl Dawson today. When I lived on the beautiful Greek island of Kalymnos, he and his wife Ruth weren’t just my neighbours, they also became my friends. 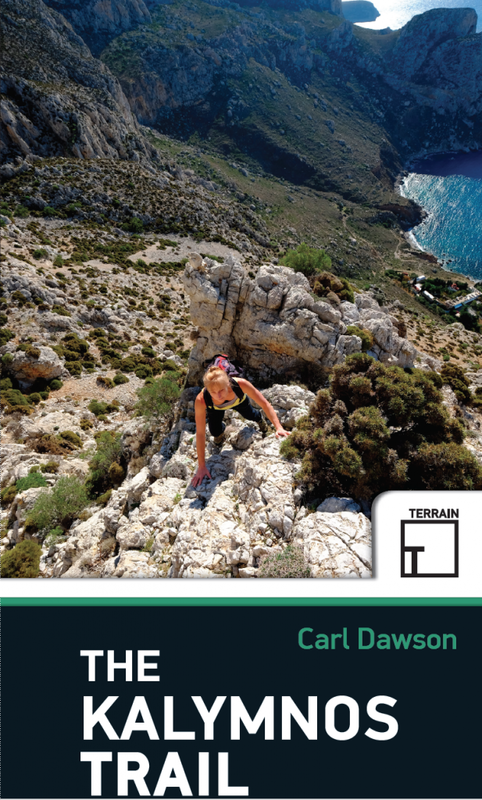 Both avid and expert rock climbers, the two of them explored every nook and cranny, so it came as no surprise to learn that Carl hadn’t just come up with The Kalymnos Trail, but written a book which shares the route with the rest of us. Here’s Carl to explain why he wrote the book. I was never much of a walker. Well OK, I once did the UK’s Coast-to-Coast trail but owing to a miscalculation with holiday time I had to average 24 miles a day continuously for a fortnight. That pretty much cured me of long treks. I also own up to having done the best bits of the Pennine Way. Oh, and the Cuillin Ridge on Skye, but that’s about it. Rock climbers have things called ‘active rest days’. After a day or two of swarming up rocks, hyperactivity sends us climbers out to recover torn muscles and shredded fingers by swimming to a distant island or scrambling to the top of a mountain ridge to see what’s on the other side. For no good reason other than the time-honoured excuse: “because it’s there”. For me, walking falls into this category. Ruth and I came to the Aegean island of Kalymnos for the first time in 2002 when the climbing guidebook was just a floppy pamphlet. As the book grew into its latest 360 page incarnation, so did our love for the island. We bought a tiny house here. Suzie Tullett, the author, was our good neighbour. We climbed, planted olives trees and almonds and figs, and on those rest days, our mini travels led to the discovery of monasteries, Byzantine ruins, Bronze Age sites, mountain tops with 360 degree ocean views, uninhabited fjord-like bays. Slowly, as we got to know the island’s fading network of ancient pathways and shepherds’ trails, the concept grew that all these places could be linked into one continuous and varied trail. But I couldn’t work out how it could all ‘connect’. For a continuous trail to exist, a way had to be found through the rugged sea-cliffs lining the east coast, from the tiny village of Palionisos to the silent remote beaches of Pezonda. Impossible and impassable was the verdict of several hikers from elsewhere in Europe. Not so, said the crinkled goat farmer on a chance encounter by the rocky shoreline of Palionisos Bay. But definitely ‘πολύ δύσκολο’. Even my basic Greek took that to mean ‘pretty damn hard’. But if the goats could do it, and if the villagers needing the doctor in distant Vathy Valley could do it, then so could a determined hiker. This final link meant that a circuit was possible. 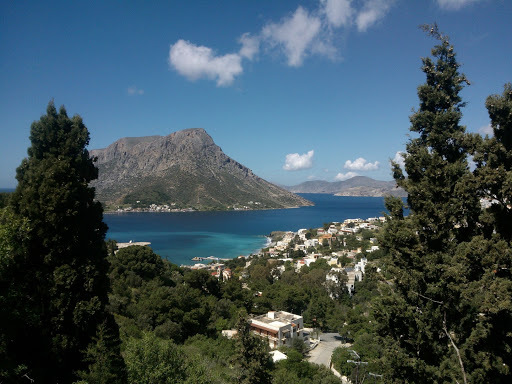 The Kalymnos Trail, or at least the concept, was complete. For me, knowing that it could be done was enough. I’d been able to experience the most tranquil moments of my life, where goat bells were, absolutely, the only sounds. True, on many occasions a broken ankle would have been ‘difficult’, but just being in this landscape of herbs, the phrygana, high above the Aegean, was enough. However, I do like to see things through. I did want other like-minded people to see this rugged land. I did want those quietly fading ancient paths to be walked again: I didn’t want their massive yet understated histories to vanish forever. So, what remained was to make one hundred kilometres of cairns and waymarks, write an interesting description (‘turn left, walk 500m, turn right’ just wouldn’t do justice to this Greek island), take lots of good photos and find a willing publisher. Fortunately Stephanos Psimenos, boss of Terrain Maps, also loves the mountains and has a deep affection for Kalymnos. His company was already active in producing high quality walking maps to Greece and, for him, walking/trail guides were the obvious next step. We got on well, we walked together, the Terrain design team committed to the project and so The Kalymnos Trail hit the shops on 20 May 2015. The Kalymnos Trail is a description of 100km multi-day trekking route around the island of Kalymnos. It is a tough walk, requiring mountain skills and the experience to handle exposed scrambling in places. The book has 160 full-colour pages in an easy-to-carry 20cm x 12cm format. Other than a detailed description of The Kalymnos Trail, the book also offers an introduction to the Kalymnian landscape, flor, fauna, history, archaeology etc. Easier walks are described in an appendix. The Book is available through the Terrain website or from the author: price 12 euros plus postage. Local shops on Kalymnos also stock the book. 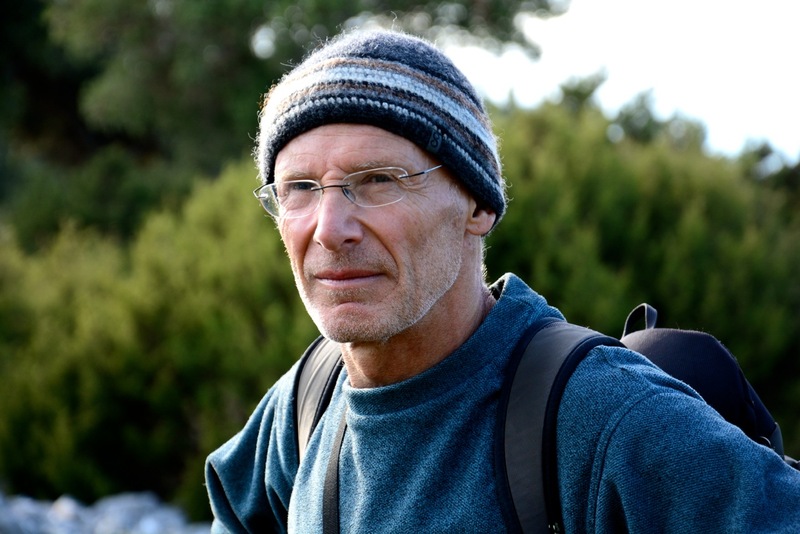 The author, Carl Dawson, has walked and climbed since boyhood and will shortly be celebrating 50 years of mountain activities. This life-long enthusiasm has extended to editing and authoring several climbing guides. Since retiring from teaching, Carl and his wife Ruth have become Greek residents and share their time between Holmfirth in the North of England and the Greek island of Kalymnos.